There's a lot of excitement in the office at Aladdin's Gold Casino this week as the they pay out over $220,000 on four players' big wins. Between them the players won jackpots totalling nearly a quarter million dollars. "It's always exciting to see a player enjoying a round of good luck" said Carl from Aladdin's Gold. "It was pretty incredible to see four players having winning streaks at the same time!" One of the big winners was 'Lisa', a 49 year old accountant. She won a progressive jackpot of over $75,000 on Spirit of the Inca. She said she'll be sensible and pay off some debts, but she actually doesn't owe much (she's an accountant!) so she'll have lots left for a holiday in Vegas with her daughter. Four players won a total of $220,000 during winning streak weekend. When asked if she had any advice for wannabe jackpot winners, Lisa said "Make sure you play to win, and have patience. I've been really successful and it certainly seems to have worked for me." The same incredible day, 'Lillian' won well over $90,000 on another progressive jackpot slot, Megasaur. "I play for more of the fun of it. I nearly fell out of my chair I was so stunned staring at the screen! My parents live back East, so I'll save this for the holidays and spend it with them." Lillian also reminds players that patience is a virtue: "I always say stick with the spins. I do $125 bets and just when I'm about to give up, I spin a couple more times and I tend to get my money back. Last night, for example, I'd played over $1000 and then won $1800 back, so you just have to be patient. " Two other players won local jackpots that weekend. One player won over $30,500 on the new Wild Wizards slot and someone else won almost $10,000 on Let 'Em Ride. 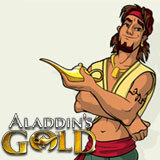 Fortunately, Aladdin's Gold Casino is one of those that we know is good for it. they have lots of slots and table games and they welcome players from all over the world. I've met the people at Aladdin's Gold and have no reason to doubt them when they tell me four players had a great weekend in the casino.